Global Superstar, Mariah Carey set to wow Singapore this October with ME. I AM MARIAH 2014 Concert! 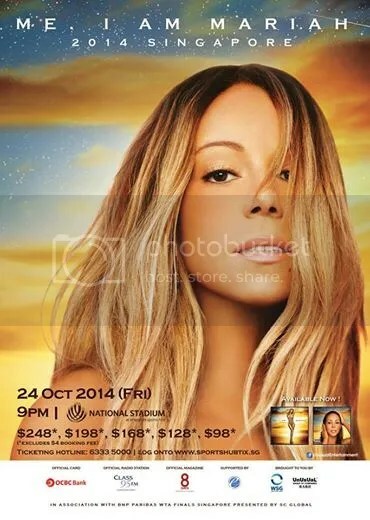 Five-time Grammy Award Winner, Mariah Carey will be in Singapore for a one-night only concert at the new National Stadium on 24th October 2014. The female global superstar last performed at the venue 14 years ago, making her the first artiste to crossover from the old stadium to the new. The last time the pop star was in town was four years ago when she performed at Singapore Grand Prix 2010. With her distinct five-octave vocal range, prolific song writing, and producing talent, Mariah has defined the modern pop performance. Her portfolio includes 5 Grammy Awards, 9 American music Awards, winner of Billboard’s “Artist of the Decade” Award as well as BMI’s “Icon Award” to cite a few. To date, she has sold over 200 million albums as well as 18 billboard #1 singles with classics such as ‘We Belong Together’ and ‘Hero’, making her the best-selling female artiste of all time. Mariah released her fourteenth studio album, ‘Me. I Am Mariah… The Elusive Chanteuse’ this year and has gained positive reviews worldwide from both the media and fans! ‘Me . I Am Mariah’ 2014 Singapore, is held in association with BNP Paribas WTA Finals Singapore presented by SC Global, and proudly brought to you by World Sport Group and UnUsUaL Entertainment. Don’t miss your chance to witness a breathtaking performance from the sensational pop queen this October. Get your tickets now if you haven’t!